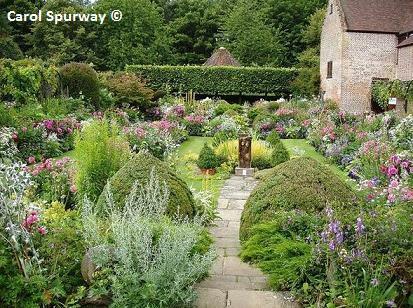 Chenies Manor House is an early-Tudor (15th/16thC) house, brick built with fortified tower with beautiful gardens. Chenies Manor was the original home of the Russells (Earls, now Dukes of Bedford) and was often visited by Henry VIII and Elizabeth I. There are a variety of gardens influenced by the Arts and Crafts movement, which include a Tudor-style sunken garden, a white garden, Victorian kitchen garden and 2 mazes. A display of over 4000 tulips and other bulbs is on show in April and May. An abundance of colour throughout the summer with roses and cottage garden plants will ensure your visit to Chenies Manor is rewarded. The historic house is also open and must be visited. Chenies Manor and Garden 2019 - 2 April - October - see website for days and times. There is a programme of events throughout the year. If you want to find places to stay near Chenies Manor Garden, why not stay in one of our recommended hotels. Each hotel has genuine guest reviews enabling you to book from anywhere in the world in total confidence. Look now for Chenies Manor Hotels - click here.